No one could doubt that Frederick Warren Merriam was one of the earliest and most important of Britain s aviation pioneers. Indeed, he taught many of the others to fly; men such as Air Chief Marshal Sir Philip Joubert de la Ferte, Air Commodore P.F.M. Fellowes (who led the aerial Houston Everest Expedition), and Sub-Lieutenant R.A.J. Warneford VC, the first pilot to shoot down a Zeppelin. 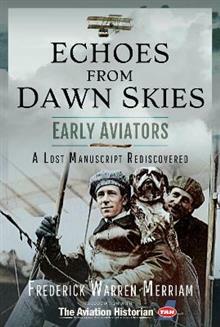 In his later years, Merriam decided that he wanted to compile a book that presented a more personal and intimate picture than has yet been produced by aviation history writers of the civil pioneers of British flying . It was no simple task. Some two years ago, Merriam continued, I conceived an idea and set to work most energetically to hunt up all the survivors of those wonderful days, to ask them if they would each contribute a story of a personal nature, something that had never before been published. It was a tall order and admittedly my hopes were not too high of finding sufficient material of the sort to fill a book. A tireless search ensued for more than a year. Many obstacles and disappointments assailed me. Of some oldtimers no trace could be found, others had passed on and one or two were too tired to trouble. However, after a little gentle persuasion [many] made the effort. The remarkable collection of stories that Merriam gathered together was never published, his death in 1956 curtailing the project. For more than sixty years the manuscript lay hidden away, all but forgotten, until it was rediscovered in 2013. Frederick Warren Merriam was born Frederick Warren but changed his name by deed poll in 1901 to Merriam after being befriended and sponsored in his flying aspirations by an American, Olin Merriam. At the controls of a Bristol Box-kite, in 1912 he was the first pilot in Britain to fly through cloud. Later, as manager and chief instructor of the Bristol Flying School at Brooklands, he had many pupils who subsequently became famous. At the outbreak of the First World War Merriam was the most senior flying instructor in Britain; he duly became chief instructor to the R.N.A.S. at Hendon and later at Chingford. In 1922 he founded Britain s first gliding school, near Shanklin, Isle of Wight. It was only the toss of a coin at the Royal Aero Club which decided that Alcock, rather than Merriam, should accompany Whitten-Brown on the first direct transatlantic flight. Forever linked with the earliest days of British aviation, Merriam died at Christchurch, Hampshire, on 12 November 1956 at the age of 76.